Iranian President Mahmoud Ahmadinejad says his country "does not need atomic bombs", amid continuing controversy over Tehran's nuclear ambitions. 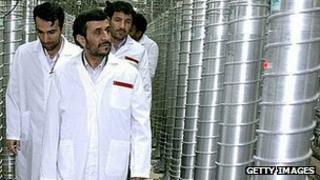 Mr Ahmadinejad, quoted by state broadcaster IRIB, warned the US would "regret" any confrontation with Iran. The UN's atomic watchdog is expected to say this week that Iran is secretly developing a nuclear arms capability. Israeli President Shimon Peres said on Sunday that an attack on Iran was becoming more likely. Iran has always insisted that its nuclear programme is for civilian purposes. Mr Ahmadinejad accused the head of the UN's International Atomic Energy Agency (IAEA), Yukiya Amano, of being a puppet of the US. "This person does not publish a report about America and its allies' nuclear arsenals," he said. "If America wants to confront the Iranian nation, it will certainly regret the Iranian nation's response," IRIB reported. "If you think by pressuring the Iranian nation, you can change the situation in the world, you are very much mistaken. "They are saying that Iran is seeking the atomic bomb. But they should know... we do not need a bomb. Rather, we will act thoughtfully and with logic." Diplomats say the IAEA report, due for release on Tuesday or Wednesday, will produce compelling evidence that Iran will find hard to dispute. On Tuesday, Israeli Defence Minister Ehud Barak played down speculation that Israel intended to strike Iranian nuclear facilities. "War is not a picnic. We want a picnic. We don't want a war," Mr Barak told Israel Radio. On Sunday, President Peres told the Israel daily newspaper Hayom that "there is an impression that Iran is getting closer to nuclear weapons". On Monday, Russian Foreign Minister Sergei Lavrov warned that military action against Iran would be a "very serious mistake fraught with unpredictable consequences". He said diplomacy, not missile strikes, was the only way to solve the Iranian nuclear problem.